One of the most elegant and high-end rustic-style wedding venues in Oregon, Brasada Ranch knows how to pull off the picture-perfect wedding. This is for the bride looking for a barn wedding venue in Oregon who could do without the cow patties. 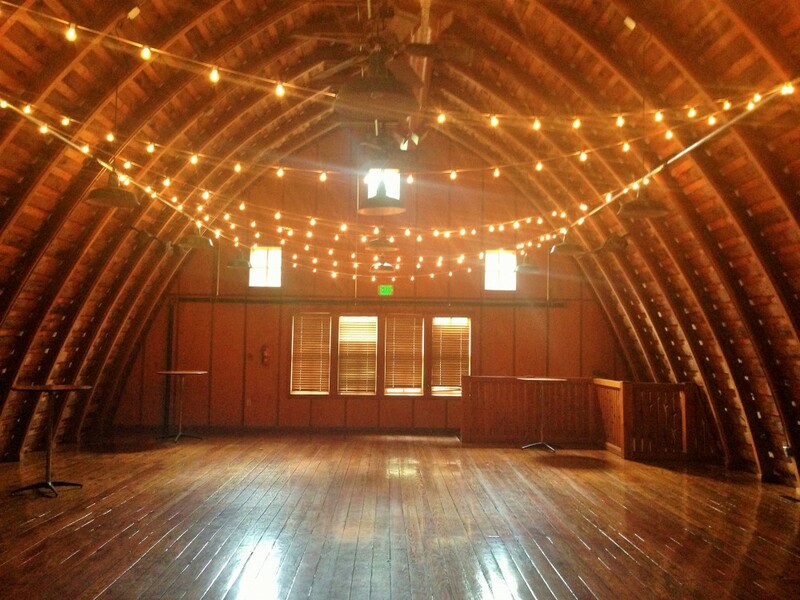 The actual venue called “The Barn” is the only place we’ve played for weddings at Brasada and it’s the most popular of Brasada’s five locations for ceremonies/receptions. Take in breath-taking views of the high desert, enjoy the grassy-lawn, and find endless photo ops at sunset. Known for it’s incredible pumpkin patches with the backdrop of smith rock in the distance and family friendly events like the Country Christmas, a wedding at DD Ranch is for the bride and groom looking for an authentic country-style wedding without the fake frills. This is a real working ranch that does weddings on the side, not a wedding venue that keeps a few cows around for the photo ops. This could be a really cool option, particularly if your friends and family appreciate the window into legitimate western rural culture. It will feel like a field trip! The lodge and cabins at Rock Springs were renovated a few years ago, and so this venue perfectly blends modern amenities with a reverence for nature and country living. Get married beneath towering Northwest pines or right by the reflecting pond. The fields of the ranch spread out into the distance and the overall feel is spacious and sophisticated. The best part is, its just a few minutes from downtown Bend. The rounded roof of the restored white barn is the defining feature of this working vineyard with views of Smith Rock and the Three Sisters. Wild flowers, a reflecting pond and rolling hills in the distance make this a lovely spot for any couple looking for a classy and countrified wedding venue in Central Oregon. This historic barn had to have been renovated with weddings in mind… it’s almost too perfect! And the price is right… reserve a year and a half in advance to take advantage of the $600/day rental fee. The first floor can accommodate 55 guests at tables, but there is plenty of room outdoors for seating in a large well groomed, fenced in lawn area. 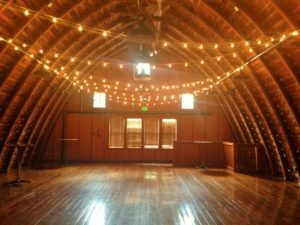 The second floor makes the perfect dance floor with vaulted ceilings perfect for acoustic music, and as a staging area before the ceremony. The Barn is the centerpiece of an historic homestead that ran from 1939-83. Today it is the entrance to a 16-acre park, featuring nostalgic-looking groves of trees just waiting for your perfect wedding day pictures. Yes, their website might look like it was made when the internet was first invented, and yes, their logo looks more like a scary, drunken tattoo, HOWEVER, if you can click just a little deeper, you’ll discover a genuine country gem in Sherwood, Oregon, with a big red barn just waiting for your family and friends to rip it up on your big day. Their website is worth a visit if nothing else to discover their photo collection of heart-shaped rocks. This place is totally pro. Just an hour or so from Portland, it will absolutely fit the bill for couples looking for barn wedding venues in Oregon. There is a perfect wooden bridge crossing a creek perfect for group shots, but the crown jewel of the whole experience is going to have to be the Old Time Saloon they have on property, which looks actually old and actually western! Hold off on the shots till after the ceremony boys. The folks at Postlewaits aren’t messing around, so I’m sure you’ll be paying top dollar, and in exchange you’ll have a generally spotless event. There are dozens are barn wedding venues in Oregon, and more and more are popping up every day due to the popularity of the rustic chic theme. Some of the venues run by local parks and rec departments are the best deal, but will require the most effort on your part to pull off. Other sites like Brasada and Postlewaits will deliver a professional, custom experience and help you as little or as much as you’d like. Our band the Ashlings is perfect for barn wedding venues – we play classical during the ceremony and upbeat cocktail music for the reception. And our cello/violin/guitar trio specializes in learning you special song!